A beautiful capture and all dressed for the weather too. Please do join me on Country Kids too. Was this a local park? Not sure what has happened to my twitter ID but it is Fiona @coombemill ! Love her spotty body warmer. Lovely picture, love her rosey cheeks. 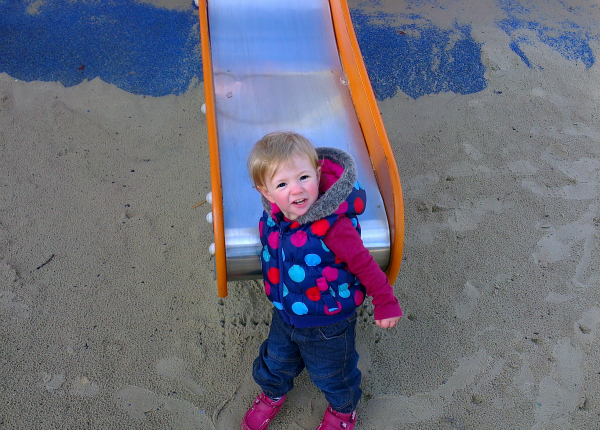 aww what a lovely photo she looks happy has she just been down the slide.. or asking to go on it? Thank you for linking up with Country Kids, I just love this happy photo. That's a proper proud "look at me, I've just done the slide" face!!! Gorgeous!